Our final full day in Spain was a great one! We had pre-planned a day trip to Toledo several months ago and today was the day for it. It involved a bit of an early start, but we got there with no problems – hooray! I’m very glad we did this trip because it was totally worth it! 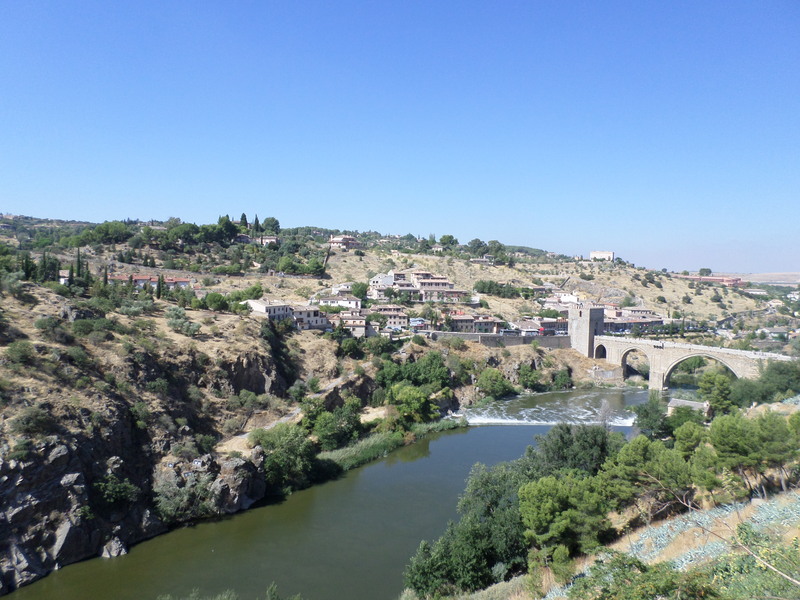 Although Toledo isn’t far from Madrid (about an hour, depending on traffic) and you could probably reach it pretty easily on your own, I highly recommend doing what we did and taking an organized day trip. I could never do an entire vacation that way, but that method is super useful for these one-day excursions. As I mentioned previously, I’ve always used Viator to book these trips in the past and they’ve always been fabulous (the Toledo trip included). The trip began with the bus taking us around the outskirts of Toledo and up to a point where we could get out and take pictures of the town. Because Toledo sits atop a hill, the views we got were awesome. I had seen similar views when I was researching possible day trip options and was super excited when I realized we were going to get to see those views in person. The picture below likely doesn’t even do it justice, but check it out anyway! Once we got into town, we started our tour at the Catedral de Toledo, an amazing Baroque building built from the 13th-15th century. The price to get in is a bit steep for a church (€8 as of Sep 2013), but one of the benefits of a day trip like ours is that all the entrance fees are included in the price of the trip. Regardless, this is a building you don’t want to miss out on because there’s so much to see, including amazing altarpieces, the statue of Santa María la Blanca, art by El Greco, and more. 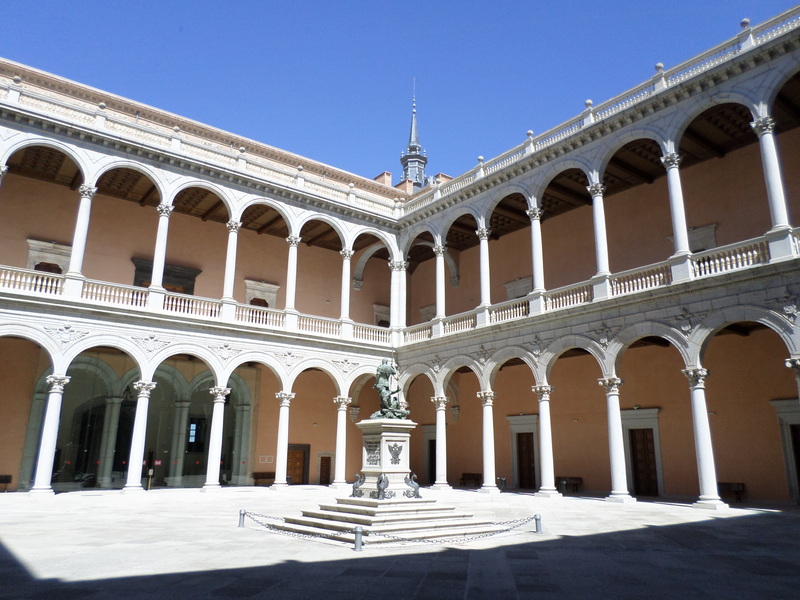 After wandering through some of the narrow streets of Toledo, we found ourselves at the Museo Victorio Macho. He was an artist from Valencia who moved to Toledo later in life. The museum is actually his former home – he requested that it be donated to the city government and turned into a museum after his death. And that’s exactly what happened. 🙂 We didn’t stay here long, but we got to see some of his sculptures as well as some great views of the land around Toledo. We made another quick stop after the museum, this time to the Synagogue of Santa Maria la Blanca. It’s not often you come across a synagogue with the name of a Catholic saint attached to it (this is the only one, in fact), but it was taken by the church during the Spanish Reconquest and turned into first a church and later a museum, which is what it is now. This one wasn’t hugely interesting as it’s basically an empty building that has some kind of art exhibition going on inside of it (that’s what was there today anyway). I’m not sure what the ticket price was here, but if it’s more than a couple of Euro, you can skip it. Our next stop was to San Juan de los Reyes, a monastery and church. 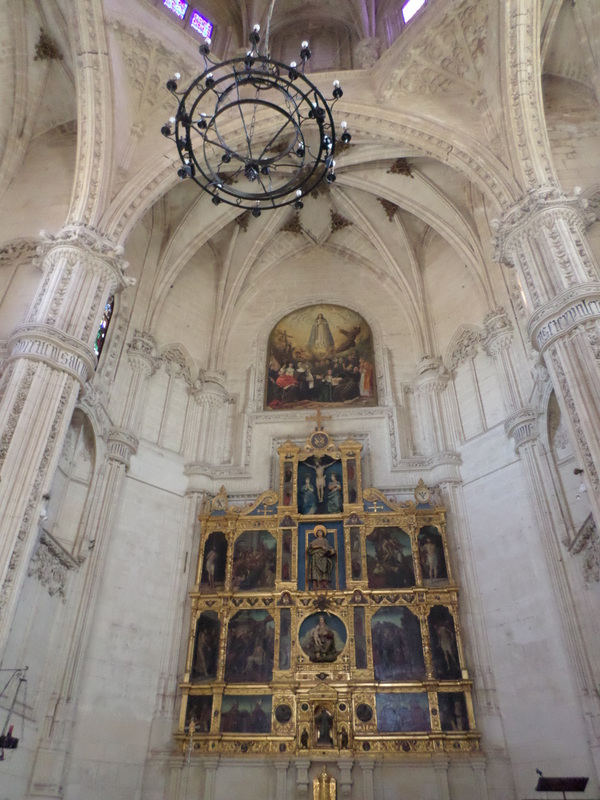 It was commissioned by Queen Isabel the Catholic and was originally intended to be the place where she and her husband, King Ferdinand, would be buried (though that changed when they decided to be buried in Granada instead). It’s a great old church, both inside and out, and is totally worth the €2.50 entry fee, so be sure to check this one out! Although the day trip included a lunch option, we opted out of that and instead visited this great place. They had a great menu of the day (Scott got that) as well as a number of tasty Spanish dishes. The prices were reasonable too, so this would make a great lunch or dinner stop on your next trip to Toledo! We didn’t have much left after we met back up with the rest of the group after lunch. We did a quick in-and-out visit to both the Alcázar and a damasquino factory. To be honest, the Alcázar was a bit of a disappointment. Although it’s an amazing building, most of it isn’t the historic Alcázar – it was almost entirely rebuilt after the Spanish Civil War ended in 1939 because most of it had been severely damaged or destroyed altogether. It functions as Spain’s army museum, which isn’t a topic that I’m particularly interested in, so while I’m glad we got to see some of it, I was happy to not spend a lot of time there. The factory we stopped at afterwards was kind of cool because we got to see a damasquino master putting together a piece of jewelry, but it felt more like a chance to try and get us to buy something before heading back to Madrid. If you’re interested in jewelry, you’ll likely love visiting one of these factories, but if not, you can easily skip it. Now, onto the photo recap! The amazing view of Toledo we got at the beginning of our tour. Me and Scott with Toledo behind us. 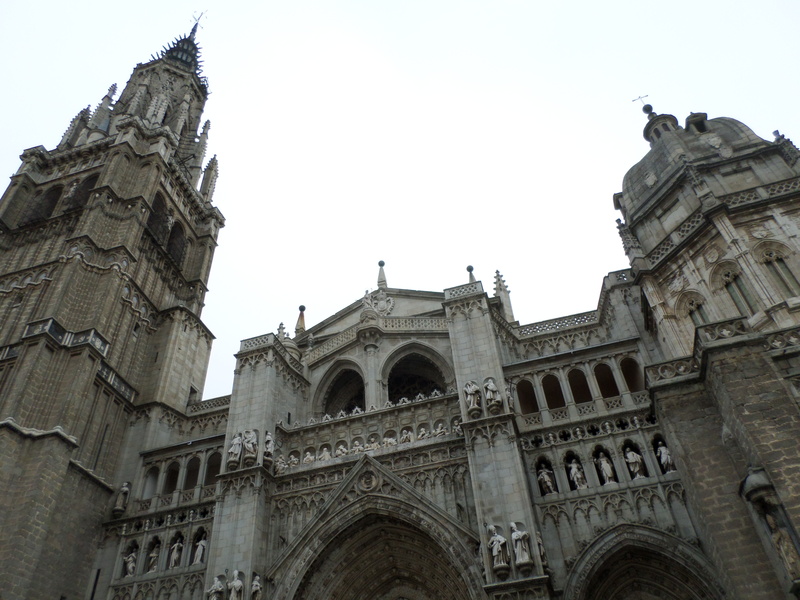 The imposing exterior of the Catedral de Toledo. The plaza in front of the cathedral. 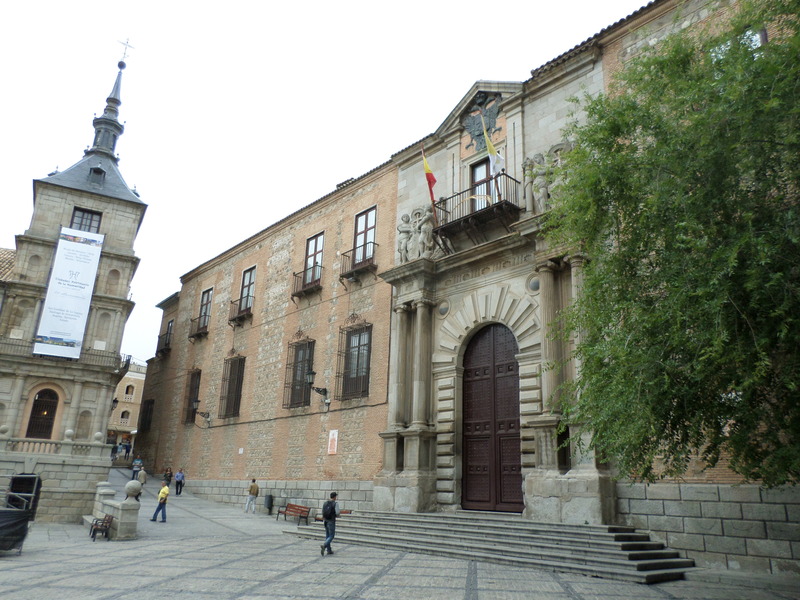 The archbishop’s home is on the right and the corner of the city hall (designed by the son of El Greco) is visible on the left. 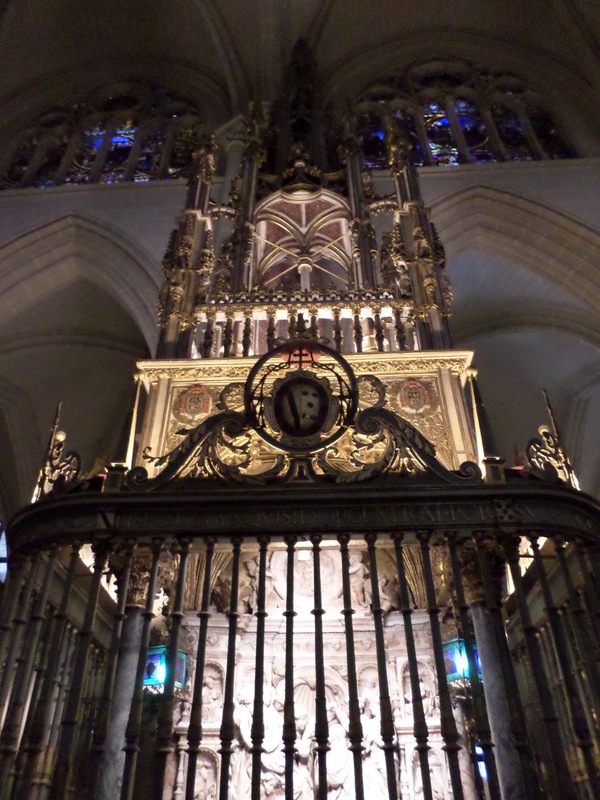 A shot of one of the nave altars in the cathedral. A different view of Toledo from the Museo Victorio Macho. 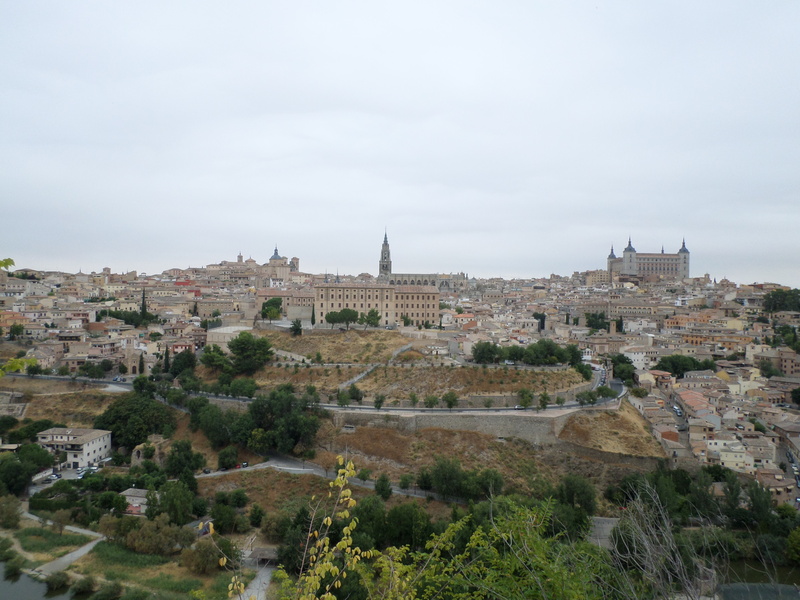 A panorama of the view of Toledo from the museum. 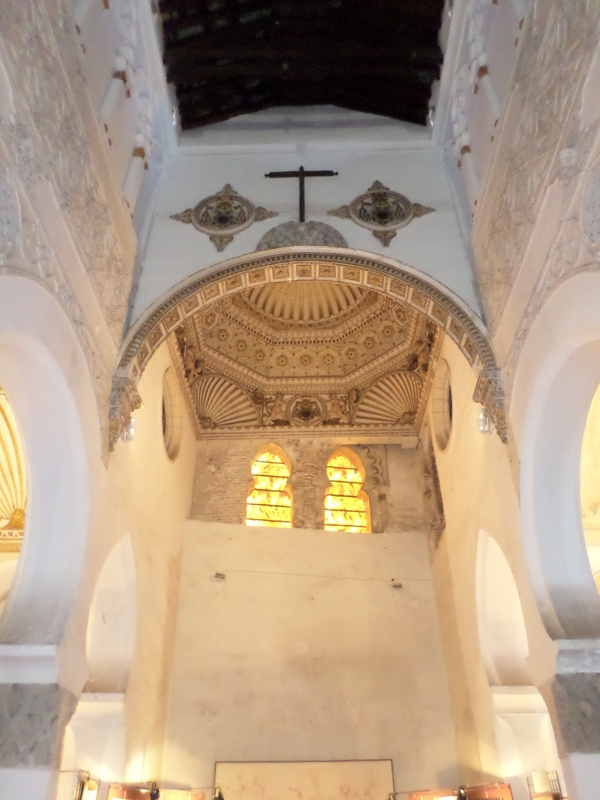 A shot of where the altar once was at the Synagogue of Santa Maria la Blanca. The interior of the church at San Juan de los Reyes (there’s also a functioning monastery here with 7-8 monks living in it). 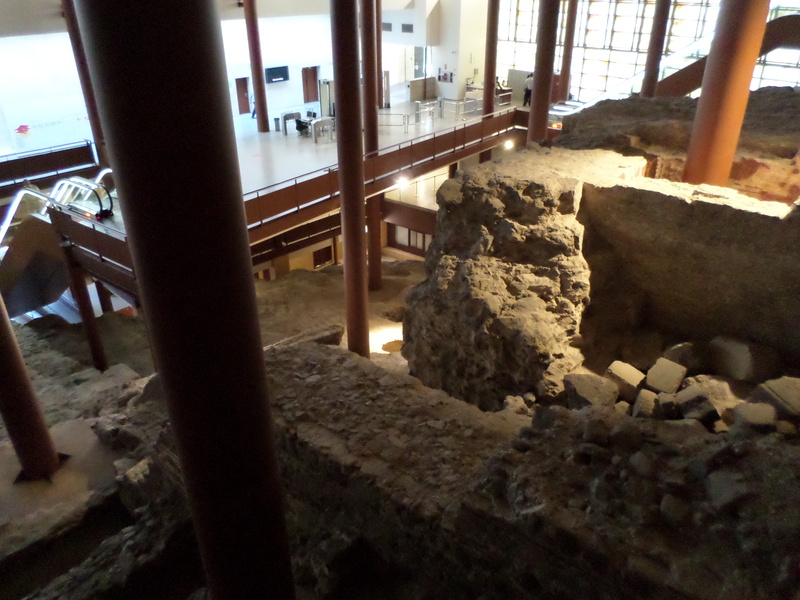 Some ruins of the original Alcázar inside the newly-built museum part of the building. Exterior courtyard in the Alcázar. What a great last day in Spain! I was particularly happy with this one because our day trip guide presented the tour in both Spanish and English and I didn’t have any problems understanding her Spanish. Although my undergraduate degree is in Spanish, I’ve been out of college for nearly ten years now and I don’t use Spanish that often! In general, it has been great to use it here in Spain, especially since I couldn’t speak the languages in any of the other cities we’ve been in thus far (aside from a little French, thanks to a summer community ed course). We’ve got another early start tomorrow as we’re flying to Florence, Italy at 10a. You can add Italian to the list of languages I don’t speak, but at least there are some similarities to Spanish (I was also in Italy on last year’s Europe trip, so I’m hoping that will help). Look for posts from Italy starting tomorrow! Pingback: ALONSO DE COVARRUBIAS (ESPAÑA,1488-1570) | "HIJO PINTOR"
Pingback: ALONSO DE COVARRUBIAS (ESPAÑA,1488-1570) « "FASTENRATH"